Attorney General Jeff Sessions on Monday drew a sharp contrast between the Trump administration’s approach to illegal immigration and those of its predecessors during a ceremony to swear in 44 new immigration judges. Sessions said his department now has “the most active immigration judges in history,” and named a goal of a 50 percent increase in sitting immigration judges since President Trump’s inauguration. There were 289 judges at the end of fiscal 2016 just before the start of the Trump administration, according to the Government Accountability Office. There are now 397, including the 44 sworn in, the Justice Department said. The Homeland Security Department, the attorney general noted, is seeking to refer 100 percent of illegal border crossers to the Justice Department for criminal prosecution in federal courts. “Our U.S. Attorneys are prosecuting over 90 percent of those cases referred to us. It’s a two to threefold increase – and it has some deterrent effect,” Sessions said. The backlog of immigration court cases as of July 31 was 746,049, according to the Syracuse University Transactional Records Access Clearinghouse immigration report. The proposed budget for next year would bring the court up to 459-484 judges, according to the National Association of Immigration Judges. 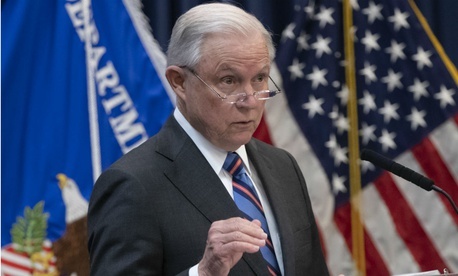 Handling the rising backlog would require doubling the current number of judges, according to the association, which is also critical of Sessions’ approach. “We obviously have a lot of concerns about the tone and context of the attorney general’s remarks,” Immigration Judge Ashley Tabaddor, speaking as the group’s president, told Government Executive. In addition, she said, Sessions “makes explicit that he’s putting quality over quality. He wants maximum production from judges,” but he encourages them to be imaginative in a way “he doesn’t seem to like in any other part of our jobs,” Tabaddor said. “He never mentions due process but highlights his preconceived notions about attorneys before the court and the individuals they represent, painting them as active participants in undermining the integrity of the law,” she said. Such abuses of the process, she added, are not something that judges can bring to the courtroom.